If you’re a fan of controlling things in your home using your voice, do we have some good news for you: LG has announced that it has partnered up with both Google and Amazon to enable all SmartThinQ devices (of which there are over 100) to be controlled by voice assistant. That means if you’re one of the millions of people with an Amazon Alexa or Google Assistant powered smart speaker sat in your home, you can now use it to control any LG SmartThinQ products you also own. This isn’t the first time that you’ve been able to control an LG product with a voice assistant, but is the introduction of an open platform that allows you to choose between Alexa and Assistant across all of LG’s smart products. It’s nice to see a sense of openness being adopted by a company as large as LG, especially seeing as one of the biggest criticisms we have of the smart home market at the moment is the walled-off ecosystems that mean you have to effectively choose a team, rather than just investing in the best devices. And with LG’s SmartThinq, there’s quite a range of devices that you’ll be able to control, including fridges, range cookers, air conditioning units, vacuum cleaners, washing machines, and more. Some of the use-cases that LG provides are the ability to ask Alexa to turn off your oven while you’ve got your hands full, or asking Assistant to get your fridge to make more ice. 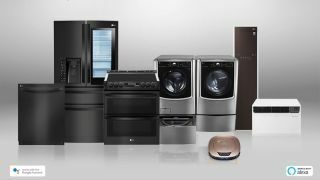 While some of the appliances possibly don’t need voice integration (we’re thinking about the washing machines) it’s a welcome move to see LG opening its SmartThinQ platform.